SUPPORT UWSC THROUGH THE BLOOMIN' BASH! The Bloomin' Bash Gala and Auction is United Way of Sumner County's signature fundraising event for the year. Like all of our events, the success of the Bloomin' Bash is dependent on the generosity of others in our community. The following opportunities are available for your and your business to get involved with this high-profile charitable event. Sponsoring the work of United Way of Sumner County gives your organization the opportunity to demonstrate your commitment to the community and enhance your reputation with employees, consumers, and other key constituencies. Your organization will also gain valuable exposure to influential audiences, including business and civic leaders. Being a United Way sponsor is a great way to get your company noticed and, more importantly, to be a part of addressing major community needs and issues that impact individuals and families throughout our community. 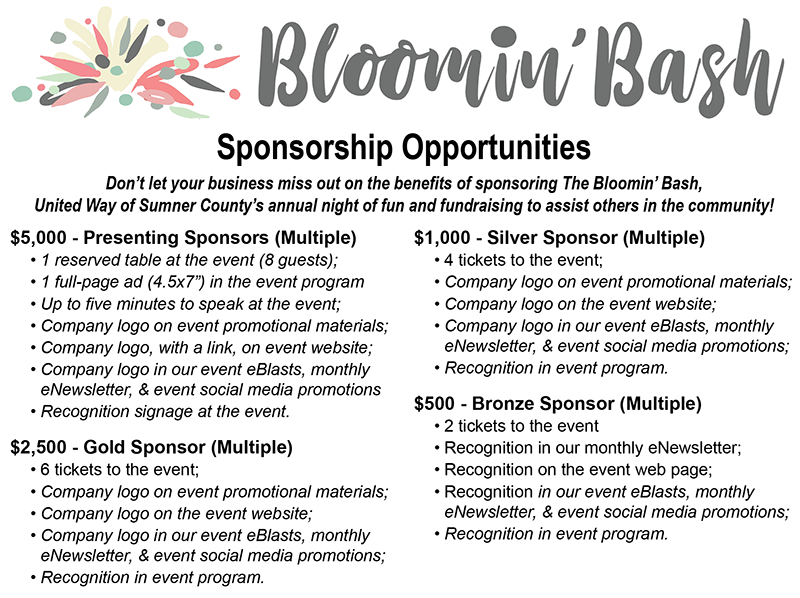 Sponsorships are available for United Way of Sumner County's Bloomin' Bash Gala at the Presenting, Gold, Silver, and Bronze levels. 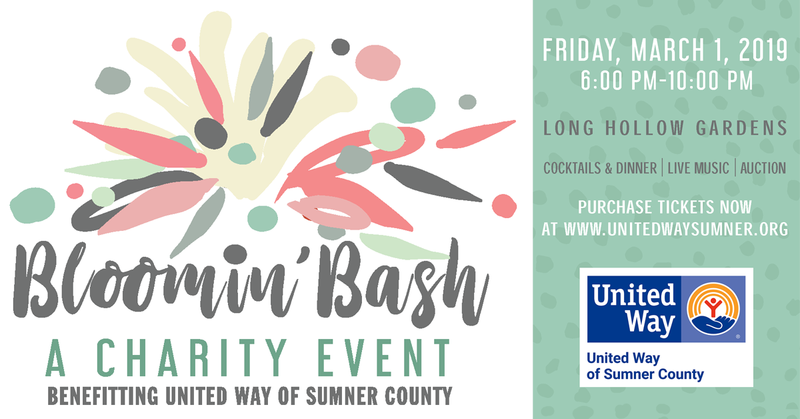 To learn more, download the Bloomin' Bash Sponsorship Packet below, or contact us at steve@unitedwaysumner.org or (615) 461-8371 today! The 2019 Bloomin' Bash Gala will include auction items to benefit United Way of Sumner County. For the auction to be a success, we need your help to secure donated items that will generate an atmosphere to bid high and bid often. For more information, please download the Auction Donation Form below, or contact us at (615) 461-8371 today!